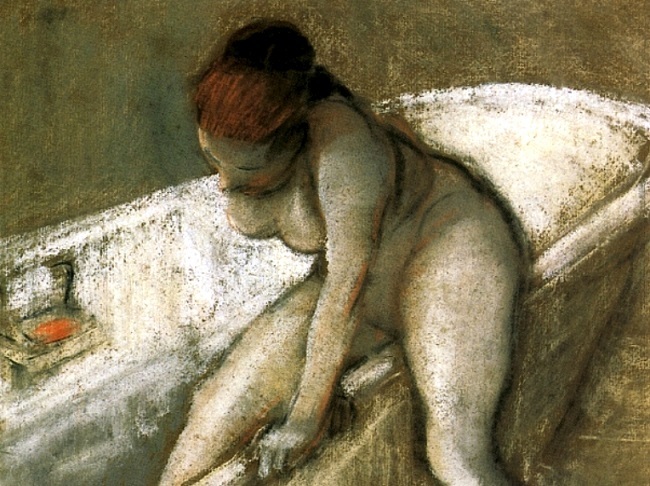 Girl in Bathtub [cropped], 1903, pastel on paper by American artist Everett Shinn (1876–1953). The full image is posted at Wikimedia Commons. And some audiences did come to hiss—or worse. Bradshaw opens the first chapter of her book Amy Lowell, Diva Poet with a description of Lowell’s first public event outside of Boston: the March 1915 meeting of the Poetry Society of America. Lowell read the polyphonic prose of “Spring Day,” the first section of which describes a narrator beginning a beautiful day with a bath. A member in the audience recalled that “as the vivid picture continued there was a suppressed snicker which rose to a roomful of undisguised laughter.” For years the incident spawned comments in the press about “Amy’s bathtub.” And much of the reaction was due to her physical appearance: Lowell was tremendously overweight. “Perhaps because of her very bulk,” biographer Jean Gould wrote, “the effect of it was almost as shocking as if she had actually appeared in her bathtub in public.” The poet Alice Corbin Henderson later told Ezra Pound, “300 pounds and a charmer,” and he responded, “Poor Amy, poor Amy," before writing in tasteless exaggeration how his favorite armchair still suffered from her recent visit. As Bradshaw admits in her study, “These observations should seem out of place in a serious book about a literary figure. 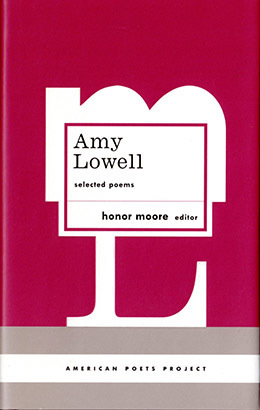 After all, what Lowell looked like should be less important than what she wrote, where it was published, its influence, and the place it occupies in modernist poetry. And yet her body and her personality find their way into much of what has been written about Lowell. . . .” Bradshaw supports her justification with numerous cringe-worthy quotes both from Lowell’s contemporaries and from subsequent critics. Yet she argues that it would be a “misreading” to assume that Lowell wanted her own personality and physicality to be ignored when one reads her poems. Instead, she contends, “Lowell willfully draws attention to her corporeality [and] implicitly demands that her personality, or rather, her body, not be forgotten.” For the last decade of her life, Lowell tirelessly crisscrossed the country, giving lectures and readings at which (in the words of Van Wyck Brooks) “she whizzed and she whirred, and she rustled and rumbled, and she glistened and sparkled and blazed and blared”—and by the time of her death at the age of fifty-one she was one of the most famous and popular writers in America. The day is fresh-washed and fair, and there is a smell of tulips and narcissus in the air. . . . If you don't see the full selection below, click here (PDF) or click here (Google Docs) to read it—free!